Syllabus of the Online Course (Subject): Tata Group (India/Parsi). The TATA Group has always been led by members of the Tata family (all Zoroastrians), except on two occasions, which was also directed by two followers of the religion of Zarathustra. “We are committed to improving quality of life for the communities we serve. The Tata Group devotes significant efforts to philanthropy, dedicating 3% of its profits to philanthropic causes. 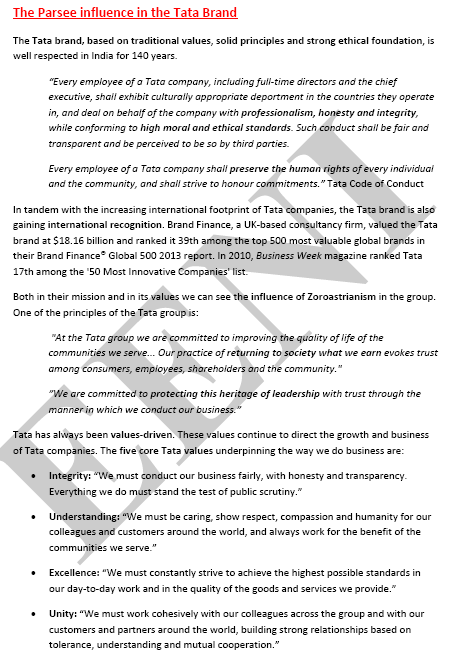 The Tata Group devoted to philanthropic causes about 170 million dollars, equivalent to 3% of net profit of the group. The Tata Group's headquarters are in Maharashtra - Mumbai. Jamsetji Tata created the Tata Group in 1868 (under the British rule). One of the historical missions of the company has been cooperating to build the modern India.